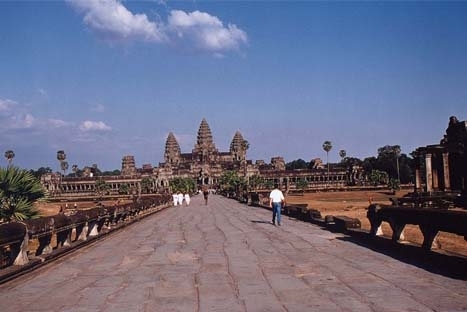 This tour takes you to several Cambodian heritages sites in Siem Reap including Angkor Wat, Roluos Group Temples, Elephant Terrace and other Khmer temples. Choose to either sightsee or hike Kulen Mountain, or explore the long-abandoned temple built in the 11th century at Beng Mealea. Visit also the floating village in Tonle Sap Lake and more. 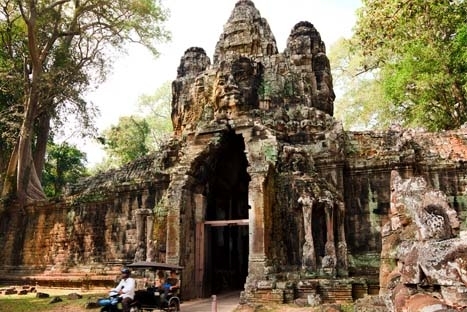 In the afternoon, start the tour to visit with the South Gate of the Great City of Angkor Thom, the famous Bayon temple, the Baphoun, the Terrace of Elephants and Terrace of the Leper King. After breakfast, visit the fabulous Ta Prohm Temple, embraced by the roots of enormous fig trees and gigantic creepers, Neak Poan and Preah Khan. After breakfast, drive to Tonle Sap Lake where you will have the opportunity to learn about life on the lake. Tonle Sap is South East Asia’s largest freshwater lake with its size varying greatly depending on the season. During the dry season it is roughly 2,500 km2, swelling to about 4 times it size in during the wet season: 10,000 km2! We will board a boat and visit the Chong Kneah village where we’ll see floating houses, farms and even a floating hospital. In the afternoon, visit the Artisans d’Angkor. Artisans d’Angkor was established in 1992 in order to support Cambodian arts and crafts, and to help young people find work in their local villages by continuing the practice of traditional arts. Among the workshops available for visit are wood and stone carving, wood and stone lacquering, gilding, and silk processing. Overnight in Siem Reap. In the afternoon, free till time transfer to the airport for your departure flight.